Today Don Borgman, John Deere, was honored with a National Biodiesel Board Lifetime Achievement Award for his service to the biodiesel industry. 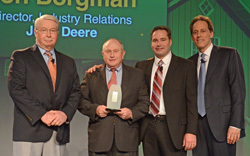 Later this year Borgman will be retiring from John Deere after over 40 years of service. Most recently he served as the Director of Agricultural Industry Relations for John Deere’s North American operations. He has been involved in the promotion and expansion of demand for agricultural products since the late 1970’s, and his work was instrumental in John Deere’s acceptance, support, and promotion of biodiesel.